Rome is one of the best cities in the world to celebrate your civil wedding ceremony. The city has three famous historic venues available in the centre, Sala Rossa Campidoglio, Caracalla and the Villa Lais. 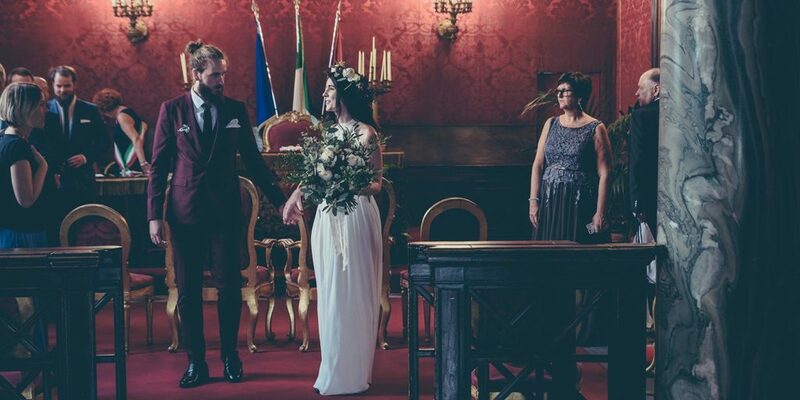 I also have a lot of weddings celebrated in the couples national embassies, especially the Norwegian Embassy in Rome, a very popular destination for those lovely Scandinavians. The Campidoglio is the most formal of the three and certainly the most elegant for civil wedding ceremonies in Rome. As you will see from the photographs the room is RED, red carpets, red damask tapestry walls, cream and gold ornate vaulted ceilings, red velvet covered chairs, it is really unique and beautiful. You enter after climbing a grand flight of steps known as the “Cordonata” which were built to a design by Michelangelo. It is only possible to marry on Saturday or Sunday, times, Saturday: 9:00-12:30,16:00-18:00. Sunday: 9:00-12:30, you can expect to pay between 1000 – 1400 Euros for the privilege and you should book at least 5 months in advance. This wedding hall is actually an old deconsecrated church, Santa Maria in Tempulo, also known as the Vignola Mattei and located close to the ruins of the Bath of Caracalla. The interior is not as grand as the Campidoglio, it is far more ‘rustic’, but still I think a very special place. It is a large space and has plenty of room for guests. To book this venue, you need to have all your documentation and pay the full fee in advance. It is closed on Tuesdays and open Monday to Saturday: 9:00-12:00, 16:00-18:00 and Sunday: 9:00-12:00, and expect to shell out 1200 – 1400 Euros. La sala matrimoni civili di Villa Lais This is a very romantic and special little venue, the ceremony is held in a small 19th century antique and frescoed chapel, it can accommodate only 20-25 people and is situated around a 20 minute drive from the city center in a beautiful big park in the Appia area. The walls are decorated depicting scenes of ancient Rome. the Villa is available for weddings on Monday and Wednesday to Saturday, no Tuesday or Sunday weddings, and again expect to pay about 1200 – 1400 Euros.